Well, where do I start? I’m feeling pretty numb. Today was the day we said good bye to my big monster. We made the decision several weeks ago. Zeus has been progressively having more problems with his hind legs, seemingly losing more and more sensation, stepping on the tops of his back feet and putting all his weight down without it seeming to cause him much pain, which was disturbing. He was tripping a lot, and his hips were rolling out badly and he was less and less stable on his feet. We’ve had to help him up pretty regularly, both from a laying down position as well as helping him up the stairs, etc. This, coupled with the anxiety problems, the digestive problems and constant worry that something would happen while we were out for a walk, creating a situation where we might get stuck somewhere (I can’t carry him after all)… we came to the conclusion that the time had come. The decision wasn’t an easy one. We’ve gone through periods of debate before about whether it was time or not, and it was always such an incredibly stressful time. With a giant dog who needs to be drugged to travel anywhere, there were a lot of things to consider. My parents and I had discussed a plan that we would bring him to the farm to do it there, and to bury him there. But that always raised issues as winters approached. Two years ago we actually dug a grave for him in the fall because we weren’t sure what would happen with him that winter and well, what do you do with a giant dog if you can’t bury him when you want to? Of course he defied the odds and perked up as the cooler weather came and here he is, nearly twelve years old. At first I wasn’t sure we could find a vet who would come to the farm for this; most of them seemed to prefer to do it in the clinic, and I can understand why, as there can be complications. But we pursued this, because it was important to me that it be as low-stress for him as possible (well, and for me too). I didn’t want to put him in a car and drive him to a clinic, where he would be a basket case after the car ride. I didn’t want to do it in the city at my regular vet and then have to drive two hours to the farm so I could bury him there. In the end my Mom talked to the vet she uses for her horses and explained the situation. They agreed to come out. They were very sweet and incredibly understanding of our situation. We said good bye the way we wanted, under the trees, listening to the birds, and without him needing to experience any undue anxiety. I should go back to the beginning. Zeus was given to me as a surprize birthday present on my 20th birthday, by my ex. We had been discussing getting a dog but we hadn’t really made any decisions. 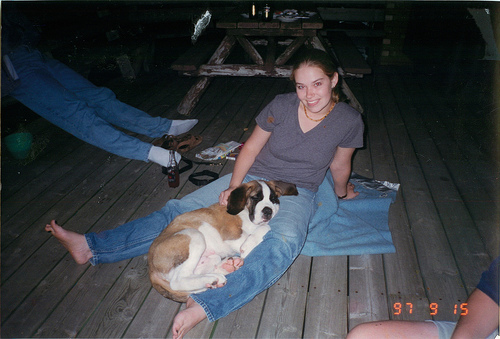 We were in Stratford, our hometown, for a wedding that weekend, and while I was off visiting my parents for dinner he decided to look into an ad that was in the paper for Saint Bernard puppies. It was an impulsive decision on his part, and I was pretty freaked out. He was the biggest baby dog I’d ever seen, and he was about to get a lot bigger. 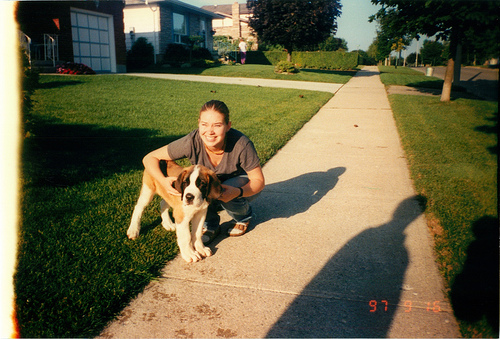 My parents didn’t want me to get a dog at all (I was still in university and living in a 1 bedroom apartment on the 24th floor of a building in Toronto). It took me two weeks to tell them about Zeus. Despite the high-rise lifestyle the big dog was house trained in less than two weeks with only a few pee accidents, and that was usually while waiting for an elevator to go downstairs. 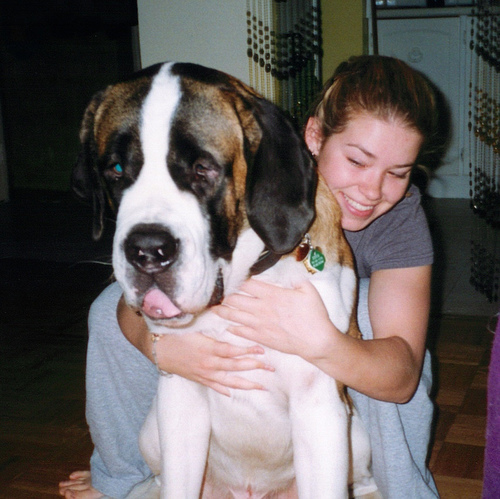 He grew to be a massive creature, at his heaviest he was about 170 lbs. 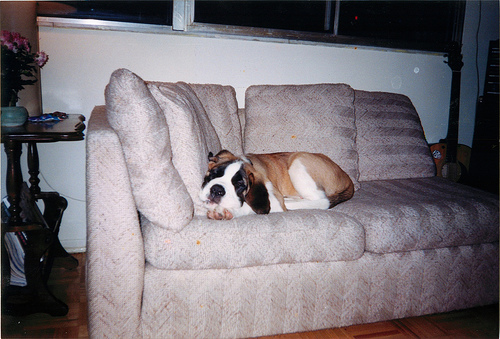 But he was a big couch potato, literally, and a very easy going and smart dog who despite his size, was surprizingly well suited to our urban life. Most people thought otherwise, and made a point of saying so. While he was a dream to train (he easily picked up tricks like shaking paws, first one and then the other, rolling over, speaking on command), there were some problems. The first time we had him in the car to go from Stratford to Toronto it was obvious this experience agitated him terribly. He panted like crazy and would not relax. This is a serious safety hazard when you have a dog big enough to block all your sight lines in a vehicle. Working with our vet we were able to find an anti-anxiety medication that would calm him enough that he would listen to commands in the car like “lay down!”. Eventually he learned the car was not the scariest place in the world so we could actually drive without using the meds. But this changed again as he got older — to the point that driving anywhere over the last several years was a bit of a nightmare. His old, slowed metabolism made it so that the medication would often take up to two hours to be absorbed. We eventually found that crushing the pills meant we could at least predict he would be ready to leave in 20 minutes (if he wasn’t sufficiently sedated before we started driving, the meds seemed to have no effect). Everything we did around traveling was to accommodate the dog. I also had terrible aggression problems with him for most of his adult life (with other dogs, not people). Aggression you say? From a Saint? Yes. Not as uncommon as you might think. It was partly my own fault. I should have neutered him at 6 months but I waited until he was a year. It took a lot of work, a lot of demonstrating my alpha position and reinforcing my expectations of his behaviour, but eventually we got to a point where I could simply read his body language to prevent “incidents”. But it meant no off-leash visits to the park. It also meant we avoided other dogs as much as possible, unless he had met them before and they were already established as friends. The attention he generated was also exceedingly frustrating. 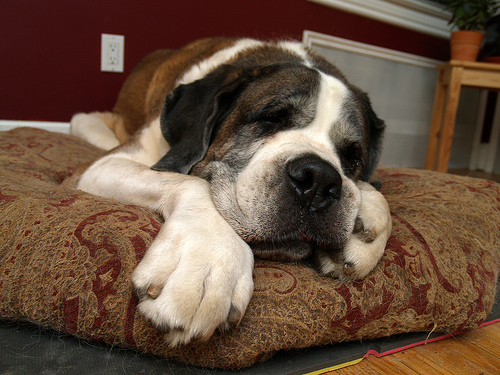 Everyone knows everything about Saint Bernards, you know. 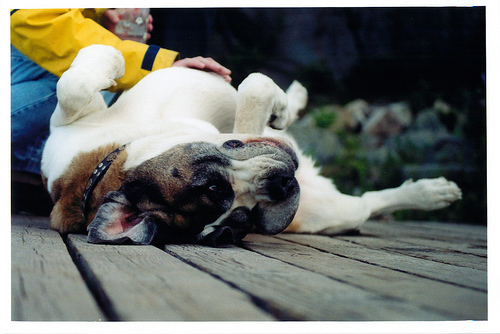 I could hardly go anywhere without being stopped by strangers to pet my dog, take photos of my dog, tell me how much they wanted to have a Saint Bernard. Chris even once experienced coming out of the grocery store to find a mother and her daughter had untied Zeus for no apparent reason and were standing there with him. While Zeus was very well behaved to be left in front of a store or to even go inside one, I experienced terrible anxiety about what other people would do. I came out of a shop once to find a man feeding him a box full of milk bones. Harmless you might say, but lets see what you think after you experience a night with a 150 lb dog with diarrhea, and you live at least three flights upstairs in an apartment. But Zeus was still the most incredible dog, a legend in his own time. He’s been on television, he’s been published in print and he’s even been a model for drawing classes. People have always been amazed by his size, his good looks (I know, I’m biased), and his temperament. He knew an extraordinary number of commands, everything from “wait” to “back up” to “over here”. He loved little kids and seemed to understand that being around them required extra special care because of his size. When my ex and I broke up it was a really tough time for me in my life. But I had the big guy to keep me going, to keep me in a daily routine. Our bond grew even stronger. I always had a huge bundle of happiness waiting for me to come home every day, no matter what kind of day I had had. Even in his last days he was a happy guy (as long as you weren’t considering putting him into the car), which is what made this so hard to do. But it was the right time to say good bye. I was ready, which was just as important as seeing the obvious signs that he was only going downhill. It was evident that his blood pressure was incredibly low, and the vets remarked that that alone was a sign that we were doing the right thing. I want to remember his vitality and his happy frame of mind, which we got to experience by spending a few relaxed days at the farm beforehand. But it doesn’t make it any easier, to say good bye to such a loyal friend. 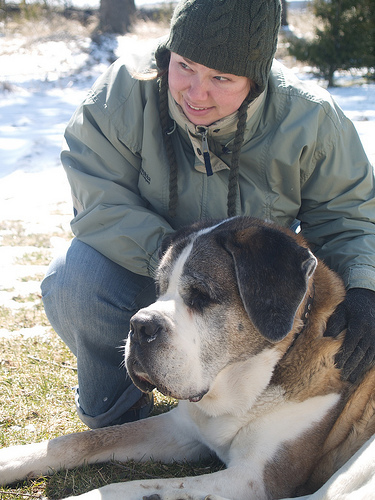 My words could go on and on about my Saint Bernard, but it would never do complete justice to what he has meant to me and my life. Chris and I are heartbroken, and we will miss him always. He can never be replaced. Good bye Zeuseroo, we love you. I’ve scanned and posted a number of my favourite old pictures of the monster, and created a set on my Flickr page. Oh my gosh girly, I am so sorry. I knew it was coming up but I completely forgot… it was his time. He was an awesome, amazing guy and he had such a great life with you 🙂 HUGS. When I first met Zeus, I never thought I would get used to having a giant dog in my life. But I was unable to resist his giant dog charm and personality. 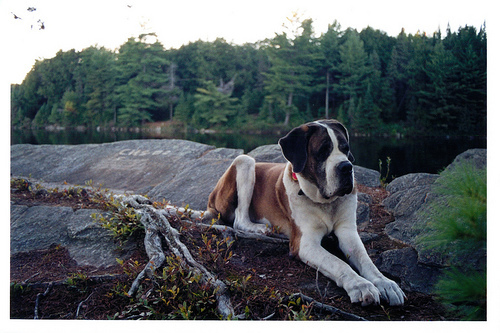 Before meeting and knowing Zeus, dogs were ALWAYS outdoor pets (I too grew up on a farm). I initially couldn’t believe that such a giant dog could be kept indoors. Now I can’t imagine having any dog that is only outdoors. 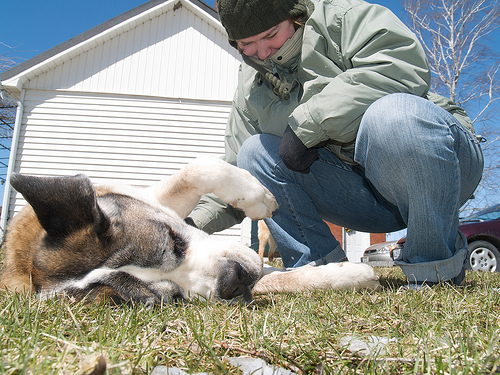 Zeus became part of my life — he was a member of our family. We miss you dearly puppy! I will miss having you there every morning, and having you greet us at the door when we come home. I think I’ll even miss your hair and slobber! My most sincere sympathies on your loss. I know how rough it is – especially when you are that close – and I appreciate your sharing your story. I’m so very glad that you found a vet willing to help out. My dad is a vet, and he’s always made efforts to do the same for his good clients because it just makes everything easier. In all honesty, I think it’s the greatest gift a vet can give sometimes. On a much lighter note, my brother spent time in Chicago working for a vet, and he said it was VERY common to have gigantic dogs living in such an urban environment! You have all my sympathy for your loss. But you also have my congratulations for having a wonderful 12 years together. I had to do the same thing for my Maremma (Basa) last year, and I still miss him every day. With tears rolling down my cheeks, I send you my love and thoughts in these very hard hours. I know how much you loved the big guy and how important he has been in your life, Sarah. Zeus couldn’t have had a better home than with you, Sarah. Zeus – A legend til the end and evermore. I’m sorry about your loss, but I’m sure it was comforting to Zeus and his loved ones to have the vet come to you. Thank you for wonderful memories of him and what he meant to you. I am so sorry. I loved your dog and always remember him by your side. I hope your friends will provide some comfort although I know he can never be replaced… Thinking of you. That is so sad. I’m really sorry to hear such a terrible loss, especially so soon after Spud… Zeus was such an adorable and intelligent creature, a true gentle giant. The big guy was definitely one of best canine friend I’ve had and was a load of fun to play with on the patio or out in the park. He’ll be sorely missed. Zeus will always be a legend in our minds and hearts. We loved that little (okay, big) guy like he was our own (we’ve even picked up his giant dog-sized poop on numerous occasions!) and it would be impossible to think about all the good times we’ve had hanging out with you for the last, oh, 12 years, Sarah, without thinking of zeusy boy and smiling. We love you Zeusers!